Ex-Jeff Hawkins, a former marketing manager for the church, says Miscavige attacked him several times. 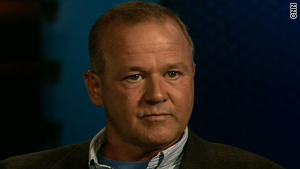 Marty Rathbun used to beat people. He admits it. But he says he was pressured to do it by his boss. 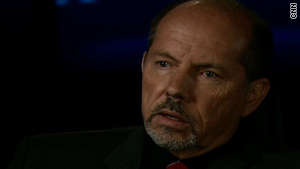 Rathbun was once a senior official of the Church of Scientology, reporting directly to church leader David Miscavige. He says that Scientology's leadership fostered a culture of violence among its top ranks and that Miscavige "constantly pushed me to get physical with people" during his time among its top ranks. "And I've got to tell you, I've admitted to some, to doing a few of those," Rathbun said. "But not like he did." 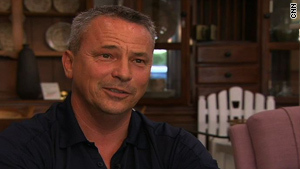 Rathbun broke with Scientology in 2004 after 27 years. Other former members support his accusation, telling stories about Miscavige kicking, punching and choking members of the Sea Organization, a religious order that is the church's international leadership team. The church emphatically denies Miscavige abused anyone or encouraged anyone else to assault subordinates. The only abusers, it says, were two of today's accusers. Meanwhile, in dozens of affidavits, e-mails and interviews, church supporters - including members of its leadership and the former wives of some of the accusers - are defending Miscavige and attacking the credibility of those who have spoken out. Church spokesman Tommy Davis said it was Rathbun's physical abuse of other church officials that led to him being removed from his job. Tom DeVocht, a former construction manager for the church, says he left because of violence. "The thing Mr. Miscavige is known for, and has been from the very beginning, is he cleans house," Davis said. "He is someone who makes sure that people who do things that shouldn't be done, they're removed." Miscavige has led Scientology since the 1986 death of its founder, science fiction writer L. Ron Hubbard. Through a church spokesman, Miscavige declined to be interviewed for this report. There is no physical evidence to support the accusations against him, just as church affidavits attacking the accusers and supporting Miscavige cannot be independently verified. But what both sides appear to agree on is that at least for a time, there were periodic beatings within Scientology's upper management. While they disagree on who was responsible for it, both sides say top officials used physical abuse as a means of discipline and intimidation. During that period, no one called police. Rathbun is the highest-ranking member of the Church of Scientology to speak against Miscavige. He was Scientology's "inspector-general" and part of the Sea Organization. Members live behind the guarded walls of Scientology's 500-acre international headquarters outside Los Angeles, provided with room and board and a $50-a-week paycheck. They sometimes wear naval-style uniforms, and their billion-year contracts with the church are a pledge not only for this lifetime, but for many others they believe are still to come. But during that time, Rathbun and others said Miscavige - Rathbun's immediate superior - frequently assaulted subordinates. He said Mike Rinder, the church's spokesman until 2007, bore the brunt of the attacks. In a 2000 meeting, he said Miscavige pinned Rinder against a table "and was whacking him upside the head," then began choking him and eventually threw him to the ground by his neck. "He had marks on his neck for a week," Rathbun said. He's not the only one to describe Rinder being badly beaten. Amy Scobee, who helped run Scientology's Celebrity Center in Los Angeles, said she saw Miscavige choke Rinder during a meeting before she left the church in 2005. "He grabs Mike around the neck, swings him around in one of the office chairs that swings around and is choking him, holding his neck, and Mike's just, like, grabbing the side of his chair, struggling, like, not knowing what was going on," Scobee said. "His face is turning red, and the veins are popping in his neck, and I'm going, 'What the hell is going on?' "
In 2007, the BBC asked Rinder about allegations that Miscavige had beaten him. He denied the reports, calling them "absolute rubbish." He left the church soon afterward and now corroborates Rathbun's account, telling CNN that Miscavige physically assaulted him about 50 times. He says he, too, got physical with subordinates. Jeff Hawkins, a marketing manager for the church, said Miscavige attacked him several times, including once during a marketing meeting. "He jumped up on the conference room table, like with his feet right on the conference room table, launched himself across the table at me - I was standing - battered my face and then shoved me down to the floor," Hawkins said. Hawkins spent 35 years as a Scientologist before leaving the church in 2005. Tom DeVocht, a construction manager for the church, left the same year, because, he says, he could no longer accept Miscavige's violence. "David asked me a question, and I couldn't tell you what the question is. Don't remember," DeVocht said. But, he added, "The next thing I knew, I have been smacked in the face and knocked down on the ground ... in front of all these people. This is the pope knocking me to the ground." In addition to leaving Scientology, Rinder, DeVocht, Hawkins and Rathbun are now divorced. Their former wives, who remain high-ranking members of the Sea Organization, are joining Scientology leaders in painting them as "bitter" former employees who are now colluding against the church. All four spoke to CNN in a joint interview Monday, along with other church officials. Rinder's ex-wife, Catherine Bernardini, said the only time she saw any sign that her husband had been beaten was when he was attacked "totally out of the blue" by Rathbun. "I know every square inch of Mike Rinder's body," she said. "I know everything that's ever happened to him, every accident, every time he broke his wrist. I've been with him, we've been together all our lives - it's utterly ridiculous, and it isn't true." Rathbun's ex-wife, Anne Joasem, calls him "a liar" and "totally psychotic." "He's alleging that when he left in 2004, it was because he witnessed Mr. Miscavige beating somebody up or whatever. Right after he left, I'm the first person he called. He called me right away. And it never came up," she said. DeVocht's ex-wife, Jennifer Linson, said she "never saw one scratch" on her husband. "I never saw one bruise, I never saw one black eye - nothing," Linson said. "Nor did he complain about anything personally. And he would've told me, because any, anything that would happen, I would know about. And besides that, that's not the character of Mr. David Miscavige." Hawkins' ex-wife, Catherine Fraser, said he "never mentioned one thing" about any abuse. Davis, who replaced Rinder as Scientology's spokesman, said that Rathbun was to blame for the beatings and that Miscavige stripped him of his authority as he learned of the problem in 2001. Scientology officials say they tried to offer Rathbun counseling, but he refused their efforts and left the church three years later. After that, Davis said, Rathbun and other ex-members "ganged up" to take on their old religion. The church says DeVocht was violent and wasted millions of church dollars during his time in the Sea Organization. It accuses Rinder of physically attacking his subordinates and says Hawkins has attended rallies with an anti-Scientology movement called Anonymous. "These are individuals who have proven not only that they would lie, but that they will get other people to lie," Davis said. "It's not much of a stretch for them to all get together, corroborate their stories, find some other people who have left years ago to try and corroborate it even more, and then come to news media and attack the very person who removed them." But Hawkins said that was "absolutely not true." "David Miscavige was the one leading this whole physical violence kick, and it was him who was beating people up," he said. Rathbun calls the accusations against him "outright lies." "I didn't come in here saying I was Little Lord Fauntleroy and never did anything wrong," he said. "I said I'm no angel. I'm going to tell you I was involved in this. But for God's sake, to make it sound like I perpetrated the whole thing is just a complete and utter fabrication." Rathbun said he never raised the issue with anyone besides his wife because of the power Miscavige wields, including excommunication. Hawkins said church members are "not going to say anything" critical of the chairman, and he would have lied to the police himself while he remained a member. "It's like the battered wife," he said. "The police show up and say, 'Why are you all bruised?' And she says, 'I just fell down the stairs.' She defends the husband." But the church's defense raises a question of who knew what, when and what was done to stop the abuses - which its leaders say is a matter Miscavige handled personally, and internally. Exactly, if the beatings were happening and there were some who could've stopped them? Only DM really. Mr Cooper can you ask Mr davis is he was in the same room at the same time where the alleged violence took place? if not, how he knows that the beatings never, ever, ever happend??? ?